The work on the Operation Bluestar Memorial, coming up at the Golden Temple Complex, is fast nearing completion. It may take the final shape even before its deadline of June 6, the anniversary of the Army operation. 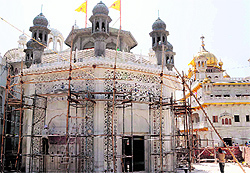 Being constructed near Akal Takht, the memorial’s construction work is almost 80 per cent complete. The Damdami Taksal, which is carrying out the work, claims it will be completed before June 6. Its foundation stone was laid on June 6 last year. The memorial is coming up in the form of a gurdwara where Sri Guru Granth Sahib will be installed. The memorial building is octagonal in shape and has doors in three directions. The area of the memorial complex is 60x65 feet, out of which the building has been constructed on 31x31 feet area. The memorial’s height has been kept two feet shorter than the adjacent Gurdwara Thara Sahib building to maintain the status of a gurdwara. A dome has not been built atop the memorial as Gurdwara Thara Sahib too doesn’t have it, though the building has been built on the pattern of other buildings in the Golden Temple Complex so that it looks a part of it. The Damdami Taksal has brought special marble from Alwar, which Rajasthani firms usually import from countries like Iran, Afghanistan and Germany. The artisans have come from Agra and Makrana. The designs being made on the marble are identical to that of the Golden Temple and Akal Takht so that there is uniformity in appearance. A special ceiling has been made so that the voice doesn’t echo inside the building. He said the history of various attacks on the Golden Temple in the past will be engraved on a stone, which will be put up there so as to acquaint the devotees.